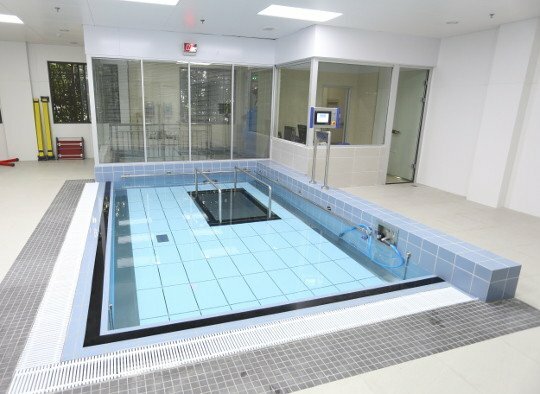 The clinical use of a movable swimming pool floor is testified in a large amount of publications, which we make available to the public through our website. 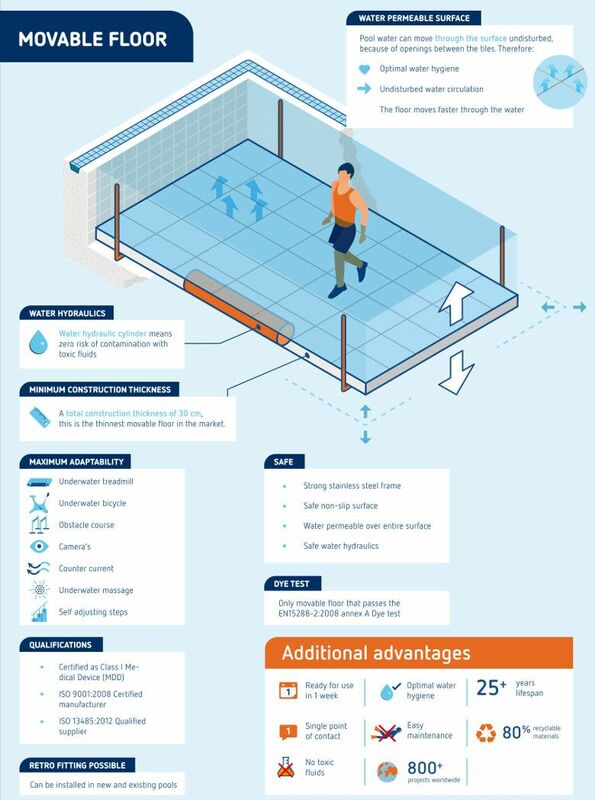 Being able to change the water depth opens a large range of extra treatment possibilities and methods which would be impossible without the use of a movable swimming pool floor. EWAC Medical has been designing and building moveable swimming pool floors for over 25 years and has successfully finished more than 1.000 projects worldwide. We continually work on improvement and innovation, like developing a walking surface that is non-slip but friendly at the same time. This is why EWAC Medical is world market leader in hydrotherapy. Therefore a higher utilization of the pool can be achieved. 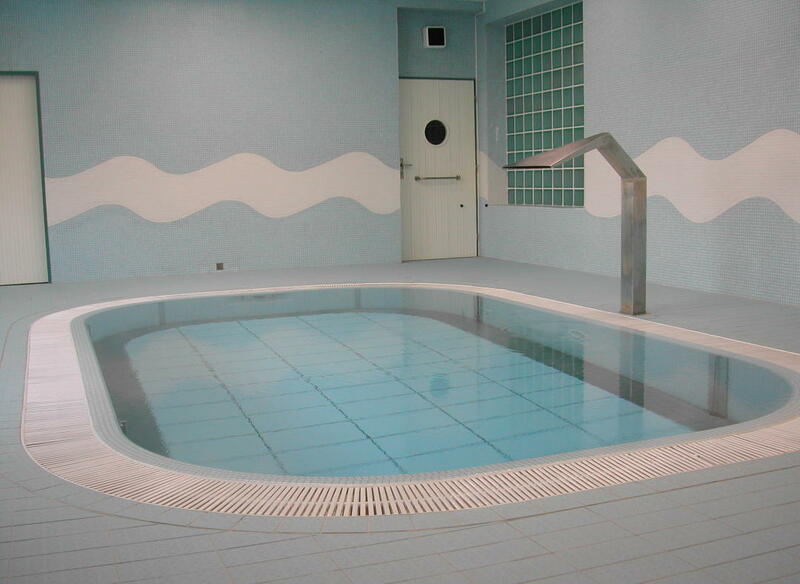 Our movable swimming pool floor is specialy developed for use in the rehabilitation and therapeutic sector. 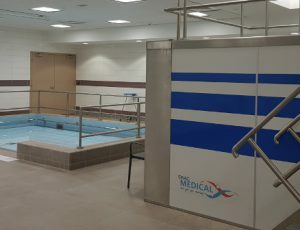 EWAC Medical not only supplies movable swimming pool floors, but also makes an active contribution to the acquisition and distribution of knowledge about hydrotherapy. 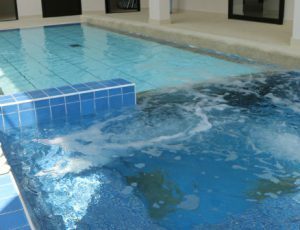 On this page you will find more in-depth information on all aspects of the use of a movable swimming pool floor in rehabilitation. Underwater treadmill Underwater treadmill can be integrated in a movable swimming pool floor, and be used to perform static walking exercises. The advantage is that the therapist can continuously watch and correct the patient’s movements from one position. This reduces the need for a large swimming pool. Parallel bars Parallel bars equipped with base plates to place on any position on the movable swimming pool floor. Used for carrying out walking exercises between the two bars. Underwater bicycle The underwater bicycle is especially designed for excercising circular motion in water. The unique feature of the underwater bicycle is that the resistance increases progressively with the rotation speed of the pedals. 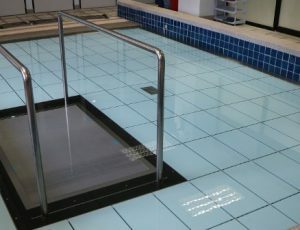 Placed on a movable swimming pool floor, the water depth can be adjusted to alter the exercise. Self adapting pool stairs Self adapting stairs. The steps of these self adapting stairs remain horizontal in each position of the movable swimming pool floor. This ensures optimal accessibility of the pool regardless to the set depth. Intergrated stairs Integrated staircase. This integrated staircase appears as if from nowhere during the downward movement of the movable swimming pool floor. The steps gradually appear one by one. The staircase is equipped with pivoting railing. Video integrated stairs. Observation window The pool can be equipped with underwater windows. This provides the therapist a complete view of the actions performed by the patient on the movable swimming pool floor. Counter current or jetstream Countercurrent unit or jetstream. A jetstream offers exercise resistance to the patient moving against the flow on the movable swimming pool floor. A wall nozzle produces a strong water jet which is aimed at the patient, and depending of the required exercise load, can be softened with air. Cameras, Lighting Lighting is recommended to improve vision through e.g. underwater windows. The lighting can be monochrome or multi color. In addition, the pool can be equipped with an underwater camera for motion analysis. Exercise materials Excercise Materials. For use in balancing exercises on the movable swimming pool floor. Can be used in combination with Halliwick or the Bad Ragaz Ring method. EWAC Medical offers a wide range of implementation possibilities, which can be tailored to the needs of users. Depending upon the requirements, for example, a swimming pool can be equipped with two movable floors separated by a movable screen. As an alternative to this system, a stair-like transition can be created between two movable swimming pool floors. See the pictures below to see animated examples of our capabilities. We believe that it should be possible to change the depth to the needs of the patient and therapist so that the rehabilitation process can proceed optimally. This is why we supply movable swimming pool floors that were especially developed for rehabilitation in the medical sector. In hydrotherapy, the correct depth for the patient and therapist depends on several variables. The physical length of the patient, the nature of his condition, the selected form of hydrotherapy and the amount of the progress that has already been made. If there is interaction between patient and therapist in the water, the ergonomic position of the therapist will also play a role. There is no fixed depth that works for each patient and for each therapy. Therefore, a movable floor is the ultimate solution to adjust to the needs of the patient. 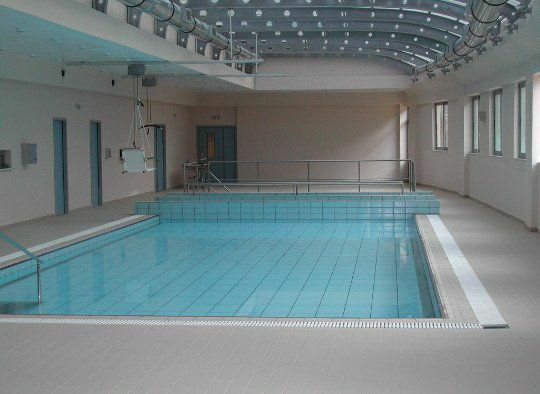 EWAC Medical movable swimming pool floors are used in the leading rehabilitation centres in the world. 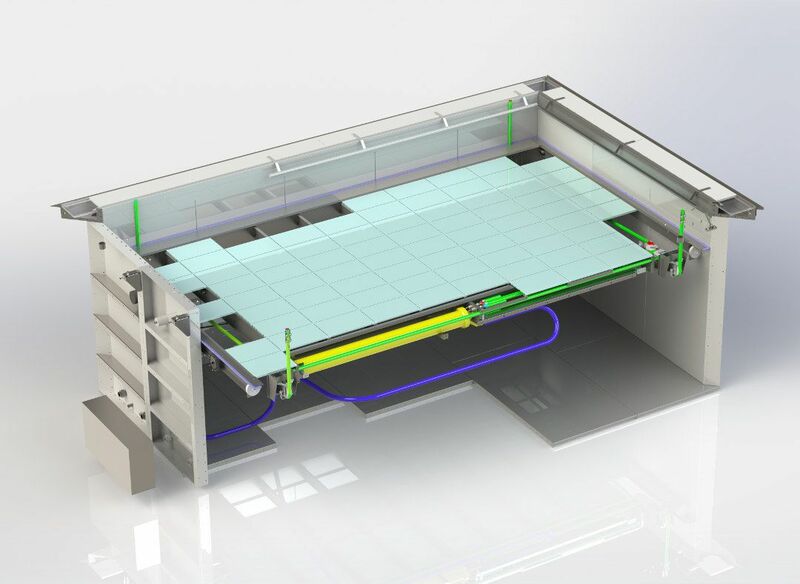 With a suspended movable swimming pool floor, the floor is suspended by means of cables that are inserted in the walls of the pool. 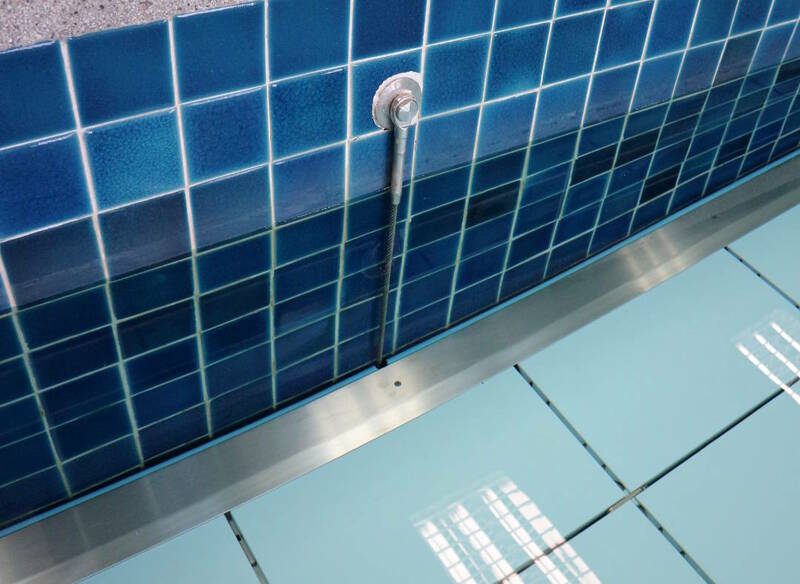 A waterhydraulic cilinder, built into the frame of the floor, can retract the cables which raises the movable swimming pool floor. The suspended movable swimming pool floor is perfectly compatible with existing pool installations. Yhe floating type movable swimming pool floor is equipped with floating bodies and can be adjusted using a water hydraulic cable system. Compatible with all pools within the measurement ranges of 40m2 – 140m2. The floating movable swimming pool floor is perfectly compatible with excisting pool situations. 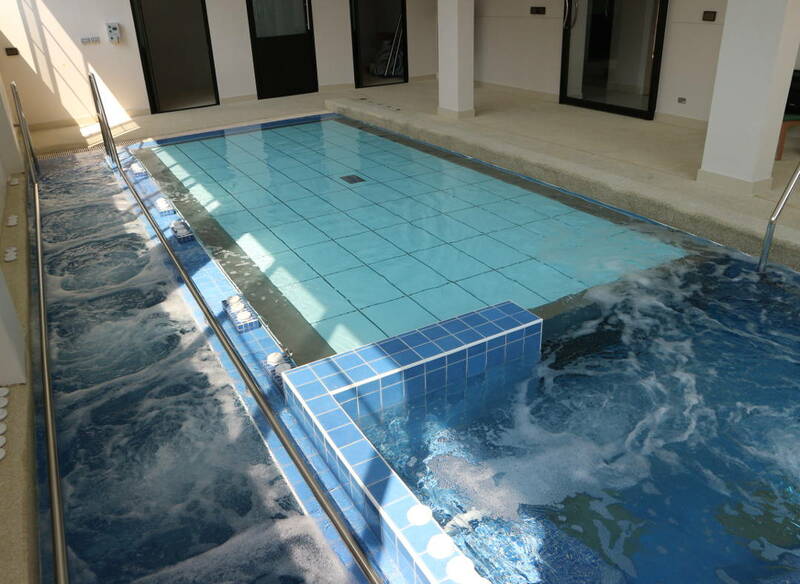 EWAC Medical movable swimming pool floor system meets the most stringent requirements for the hygiene of the water. In fact, our system is the only system available on the market which meets the requirements of EN 15288:2008, Annex A dye test. This means that the hygiene of the water is not affected by the presence of the movable swimming pool floor in the water. Therefore, vulnerable patients run less health risk in a pool with an EWAC Medical movable swimming pool floor. The movable swimming pool floor has a stainless steel AISI 316 frame, provided with a deck with removable polyester tiles. The movable swimming pool floor can be made in any shape or size. The floor is moved by a water hydraulic system, which ensures that the swimming pool water cannot be contaminated by toxic fluids in the event of leakage.